Fifty-five (55) Standard Class 7 4-6-0 steam locomotives were built by British Railways from 1951 to 1954. All except for No.70047 received names and the locomotives were commonly referred to a 'Britannias' or 'Brits' as No.70000 was named 'Britannia'. Nos.70000 'Britannia' and 70013 'Oliver Cromwell' have survived for further use following the end of steam on British Railways. Nos.70016 to 70029 were allocated from new to the Western Region, although they were later moved to the London Midland Region. These engines and also those based on the London Midland Region were frequently seen in the county. 'Britannia' Standard Class 7 4-6-2 steam locomotive No.70054 'Dornoch Firth' stands in the shed yard at Worcester It is carrying the headcode '1T80'. 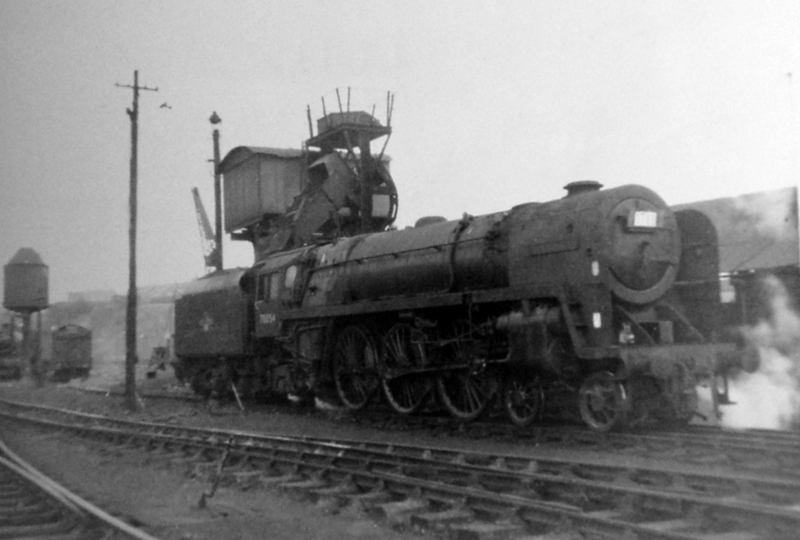 Another view of this engine on shed was taken by Mick Rock. Photograph taken by Chris Wilkinson. 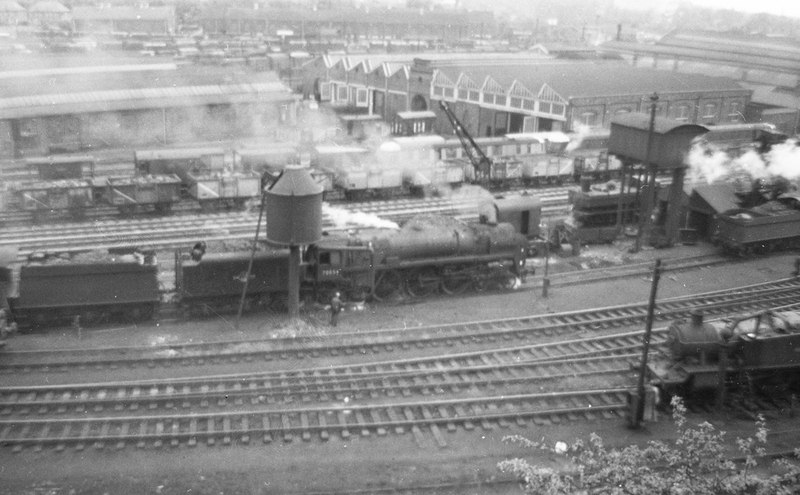 This photograph also shows No.70054 'Dornock Firth' at Worcester sheds with 0-6-0 'Pannier' tank engine No.1661 behind. This is almost certainly the same day as the photograph of No.70054 (above) taken by Chris Wilkinson and the other photograph of No.70054 by Mick Rock. The only clues as to the date that these three photographs were taken are that No.1661 was withdrawn in the eleven weeks to 20th July 1964 and that the green livery on No.70054 was introduced in late 1963 or early 1964. Thus this photograph probably dates from the middle of 1964. 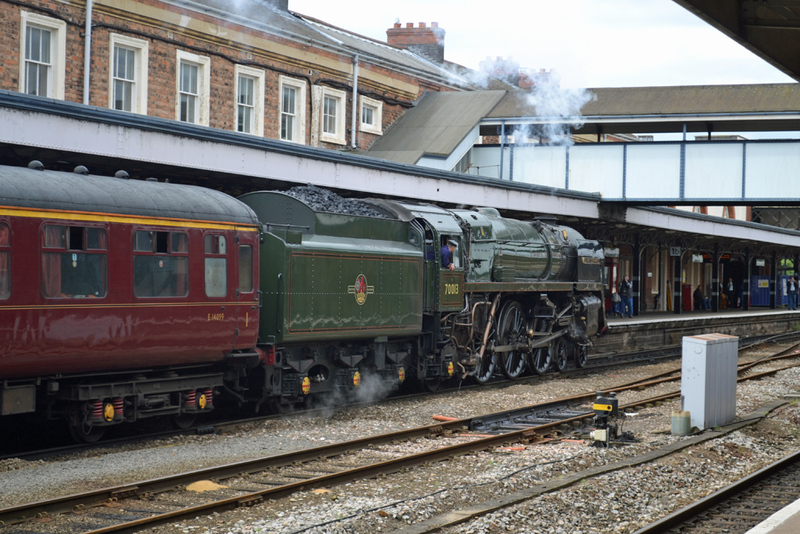 On 7th July 2012 Standard Class 7 4-6-2 steam locomotive No.70013' Oliver Cromwell' brought a special train to Worcester. Andrew Smith photographed it at Shrub Hill Station.